Fake drums are now pretty much staples of popular music. They can be done right and horribly. And it often ends up being the latter when it comes to beginner tracks of so called “producers”. Here’s a little help so your drum tracks don’t get the wrong treatment. Not even accidentally. When we say a drum track is the fake kind, it can actually be many different things. 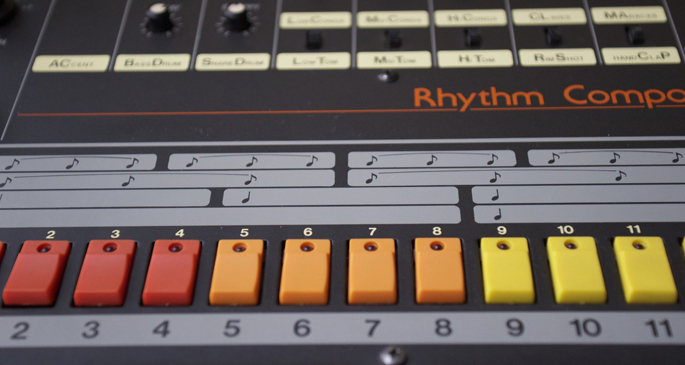 It can be a drum machine. Or a bunch of MIDI tracks turned into a drum track with the help of a drum software. It can also be something that once was a real drum track. Before it went through a lot of triggering, tempo correction and sample replacement. That shouldn’t be a problem, as long as you see it as it is and treat it like so. Even though with today’s samples and software technology, you can get real close, but it’s just not quite the same as a real drummer. Duh. On the other hand you have a lot more freedom before someone starts getting seriously pissed (usually the drummer). While most of today’s sample based drum programs sound amazing, they are kind of clinical in a way. That’s on purpose though. It’s up to you to shape them to your needs. They are sort of an ultimate version of a miked drum kit. It means that even the dry, unmodified version sounds fairly good in a song. But most of the time if you leave it that way, trained ears will perceive it as an amateurish move. Your best bet is to smear the sound; make it sound closer to the rest of your track. Saturation/distortion is a great tool to do that with. Especially the tape, transformer and all kinds of different gritty overdriven console simulations. They will take off that hi-fi top end, adding just enough compression to glue the drum sounds together. Using these effects will make your sampled drums gain a less obtrusive quality. One that renders the elements of the fake kit into a coherent whole. You can also use separate saturators on the two main ingredients: the kick and the snare. The snare often needs its own ambience – usually reverb – as well. With that, you can assign a signature character to it. It works great with drum machines as well, where you don’t even need to shoot for getting in the ballpark of a real kit. That’s when you can create your favorite gunshot snare sound out of a machine generated hand clap. Or just use another software with the sampled version of a Linn, a TR-808 or Mini Pops. Don’t forget that you can also EQ your sampled kits or drum machine tracks. Freeing up headroom with removing lows from the cymbals and hats, or boosting the drums for a different character is a trick that works great on fake drums, too. Yep. Many kids today fall for the age old cliché of compressing drums into this big sounding mess. They don’t realize that this big sounding mess loses most of its transients, so they end up with lifeless drum tracks that don’t lay down the pulse of the song anymore. If you need the rumbling effect that compression gives, try to dial it in parallel. Even this can render the drum tracks softer sounding than necessary, but at least you have some kind of control over the balance this way. But usually, the above mentioned saturators give enough compression to get the desired effect, without having to risk killing the “edge” of your drums.